After riding a 15-game win streak and surviving an 11-game skid in the regular season, Class A Short Season Hudson Valley manager Craig Albernaz had a hard time believing the fight was over, even after his team had won it all. "With the way this year has been with us battling and grinding the whole year, it honestly feels like we have to play tomorrow," the first-year skipper said. 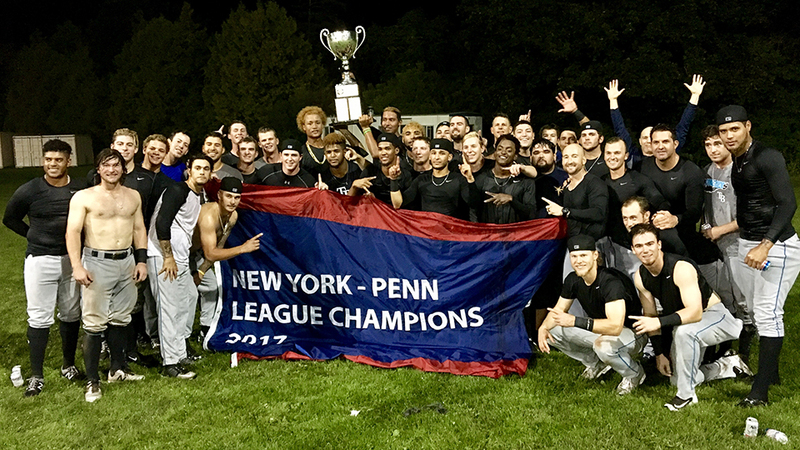 Drew Strotman threw the first six innings of a one-hitter Thursday night as the Renegades notched a 6-0 victory at Centennial Field to complete a sweep of the the Lake Monsters and capture the New York-Penn League championship. Strotman yielded a single while issuing one walk and striking out five before Andrew Gist closed out the game, allowing two walks with three punchouts in three frames. "Strotman has been outstanding for us the whole year. We didn't expect this from him, this type of outing, but we knew we were going to have a chance," Albernaz said. "[Gist] pounded the zone and just followed up Strotman's lead and went right at them, kept them off-balance with the off-speed and just gave us a chance to win. That's all you can ask for." No. 16 A's prospect Greg Deichmann recorded Vermont's only hit, beating out an infield single with one out in the fourth inning before Hudson Valley third baseman Deion Tansel mishandled Jordan Devencenzi's two-out grounder. Strotman then settled in and whiffed Payton Squier on three pitches to end his only real threat. "Everything was working. I felt good in the bullpen before the game and it just played out in the actual game," the 21-year-old right-hander said. Squier walked in the second and proved to be the only other runner to reach base against Strotman after the Renegades gave him a five-run cushion in the top half of the frame. That enabled the Rays' fourth-round pick in this year's Draft to take a more direct approach on the mound. "I expected them to just swing early. I was going to try and almost throw too much off-speed and try and keep them off balance," he said. "Once we we put up the big five-spot, that allowed me to attack with the fastball and make them beat me by putting the ball in play." Zacrey Law started the five-run rally with an infield single that took a fortuitous bounce away from Vermont third baseman Will Toffey, Oakland's No. 29 prospect. Angel Perez followed Rafelin Lorenzo's one-out double to left with a single on the ground through the right side to score two runs. Lake Monsters right-hander Parker Dunshee walked Vidal Brujan, then uncorked a wild pitch that drove in Perez before an off-target throw by the catcher Devencenzi allowed Brujan to cross the plate from first. Taylor Walls capped the inning's scoring with a solo shot to right. The No. 26 Rays prospect added an RBI single in the ninth and finished 3-for-4 with a pair of RBIs and a run scored. "You score five runs in the second inning, it's going to put your team at ease. We were fortunate," Albernaz said. "Guys just put together some great at-bats off a tough pitcher." Gist took over in the seventh and walked Logan Farrar, the first batter he faced, then got eight consecutive outs before Farrar walked again with two outs in the ninth. The left-hander then struck out Jarrett Costa on three pitches to clinch the title. "[Gist] did what he normally does," Strotman said. "Didn't try to do too much. Mixed speeds, kept guys off balance and got outs. He's done that for us all year, coming after me several times and he's gotten us this far. He knows his gameplan and executes." The title marked the first for Hudson Valley since 2012. The Renegades fell to State College in last season's Finals under former manager Tim Parenton, who left to take over the baseball program at the University of North Florida before the start of the 2017 season. At the time of Parenton's departure, Albernaz was serving as third-base coach for the Durham Bulls, the Rays' Triple-A affiliate. "It's been a whirlwind of a year," Albernaz said. "Some of them knew me from instructs and a little bit from Spring Training, but they didn't know me from a hole in the wall. Just to kind of deal with me -- I'm very meticulous about the little things -- and they put up with it and they grinded the whole year. I'm very fortunate to be a part of it."